An ongoing Reference Guide concerning portable and transportable gaming systems. Please post any portable battery powered system or even a transportable AC powered gaming system that you like playing. Any obscure systems such as Gamewatch, Treamcast, SX64 or a Jaks TV Game. Or a newer one such as PSP, Gameboy, Computer Frag Box, and Cell Phone, Nokia NGage anyone? 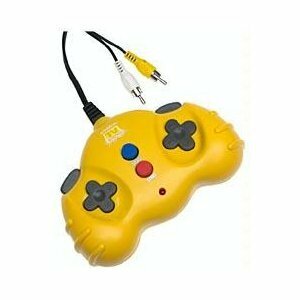 Also any unusual controller and adaptor for the portable that is utilized. For example, the original Gameboy has a ton of third party add ons, I remember noise had a miniature Arcade Cab for his Gameboy. Guess the portable games NAME and DATE. The answer further down in the following Replies. I have a few obscure portable and transportable systems myself, I'll start with two I recently acquired. Considering the Historical importance of this portable, I don't know why these slipped by me this long. I'll post some others I own later, including a very special one that I recently won at an EBay Auction. The only portable electronic game that preceded this was also made by Mattel called Auto Race. 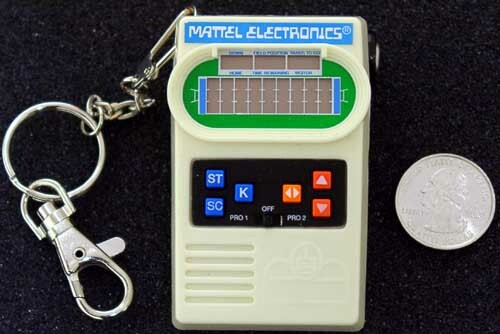 But Mattel Football is the one that was popular and fondly remembered as the start of portable electronic gaming. An easy way to spot the difference is the date on the back. If the sticker is gone, the date is also cast in the back plastic. 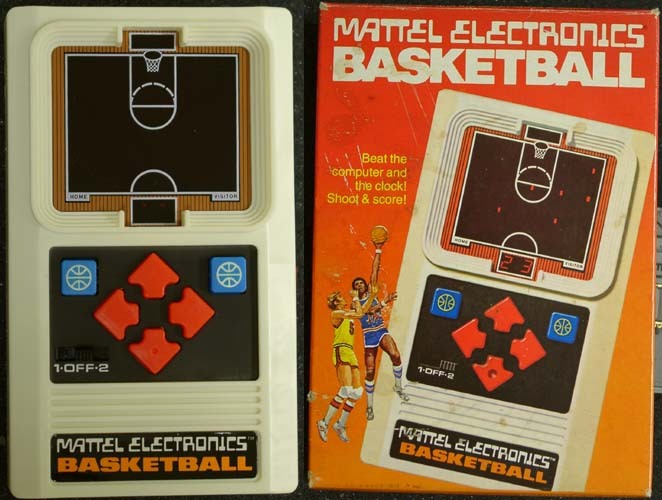 On the front of the 1977 model has MATTEL ELECTRONICS across the top and a FOOTBALL label at the bottom right. The 2000 model has CLASSIC FOOTBALL across the top and a MATTEL logo at the bottom right. The 1977 model is more collectable, but which one offers better game play? I actually bought the earlier model a week before and researched the history of Mattel Football. I remember these were popular when they came out and one of the earliest portable electronic games. This old LED game came out before Lynx, Game Gear, Turbo Express, Gameboy, and even Game Watch. When Mattel Football 2 came out in 1978, the original Football was renamed to Football 1. So I definitely have the first year run model with the optional AC adaptor input. The first game to be made available to the public (in 1976) was Auto Race followed by Football. Others were in the works (such as Missile Attack, which was previously thought to be the first). Why are there only 9 yards on the first Football? The 9 yard football was created for technical reasons (not design problems as previously thought). Okay there are only red LED lights, no HD screen here. Control the bright blip while avoiding all the other blips. I found moving up or down first to bait the other players to one side does the trick. Then a quick dodge in the other direction and a mad continual tap of the run button. Wait at the other end on top or bottom to bait the players to one side again. Then run to the right and reappear on the left. Run ten times across the field to score a touchdown, sorry no rapid fire built in so prepare for a calloused thumb. The Pro 2 switch is a harder level compared to Pro 1. The ST button displays Downs, Yards to Goal and Yards for 1st Down. SC button shows Scores of each team, Time Left and which Quarter. There is also the K button for kick a field goal or sending the ball across the other field to the other team. You can play the other team or hand the game over to a friend to beat your score. For ancient technology, pretty amazing what went into this. Powered by a 9 volt battery, the LED Lights are very bright. When you get "tackled" a referee whistle sounds. Its very loud and really sounds like the actual whistle. Score a touchdown and get the charge music. An odd quirk is that it is a 90 yard game, limited by the programming in the chip. Something about the ten mark limitation in the coding. The 1st model also has an input on the side for attaching a 9 volt AC adaptor. This one is powered by two AA batteries and is a reproduction of the earlier model. The individual LED lights are replaced by a LCD screen. The image is dimmer and the sound is not as loud. The referee whistle is just a faint tweet. There is no AC adaptor input but an additional sound off switch is added. The sound is a little quiet though pleasant compared to the ear splitting whistle of the first edition. The later model also has a shorter throw on the switches compared to the heavier bubble switch feel clicks of the 1977 model. The Artificial Intelligence on the 2000 model does seem better. The opponents react better to your moves. Not just in speed, but the way the blips reposition themselves. The 2000 model seems to have better AI, but I like the first model better and not just a collectable stand point. The 1977 model has a nice black screen contrasted by individual bright red LED lights, so much better then the red glow of the dim 2000 model LCD screen. The sounds really hit you on the 1977 model, the remake is just too quiet. This portable is fun to play and often draws a curious interest when I play while waiting in line. The look of shock when the unknowing sees those LED bulbs lighting up. I may have to download the Mattel referee signal as a ringtone. Now where is the Motorola Brick phone!? The AC adaptor input also is a nice extra, though I would probably never use it. It does allow for always available power up with no worries of internal battery leakage. A handy way to keep permanent at the desk next to the mouse. Never actually had this model when I was a kid, but I had plenty of others from the Mattel handheld line that came out between '76 and '78 or so. I also remember that those games went for about thirty-five bucks back then. Adjusted for 2002 dollars, that would probably score you a PlayStation or something today! In any case, this 12 buck imitator can't even hold a candle to the original. And that wouldn't be a problem if this was still meant for ten year olds, but I bet you the average age of the buyer for Classic Football is way over thirty. And as any thirty-year-old still able retain memories of their youth will recall, this game used to have nice, bright LEDs that were powered by a nine volt battery. The new game is powered by two wimpy 1.5 volters that can barely light up the screen well enough for you to figure out what is happening on the playing field. Note to engineers: an LCD with a red piece of plastic over it looks as ridiculous as it sounds. In conclusion, I don't know why they had to mess with success. Maybe they save four cents a unit this way, but they are losing a lifetime fan in the process. Glad my originals still work! These go for as high as a hundred dollars at Amazon. But they can also be found on EBay for five bucks. Be sure to scrutinize the logos to get the correct year model. There is a keychain miniature version of all the Mattel Sports red LCD series. Apple App file for the iPhone and iPad. Mattel Football Christmas is hilarious! CRTGAMER Posted over a year ago wrote: I will tear this house apart to find my first handheld. Guess Which Game CRTGAMER will later wrote: Guess what 1978 game I rediscovered, found stored in a box in my washroom. I was seeing stars when I battled looking for this one in the past year. Note the dates, the 1977 model was missing the battery cover, so I cutout a piece of plastic. Last edited by CRTGAMER on Sun Feb 11, 2018 8:10 pm, edited 62 times in total. Take a few Arcade cabinets and pack them into a single joystick. The disadvantage is that you need a TV to hook it up to, however this can be a good thing. Plug n Plays are smaller then a game console, an idea compact system to take on vacation and still get full sized TV gaming. A diversion over playing on the small screen of a cell phone or Gameboy. Most operate by battery and have a Composite yellow video cable and a white mono audio cable. The majority of stereo TVs will detect the single white audio input and send the mono sound to both speakers. Not quite the same as the actual Arcade, but decent emulation. The Arcade games include Pac-Man, Galaxian, Rally-X, Dig Dug, and Bosconian. The joystick has detents in the base to allow precise four way control for the games. Pacman really benefits from this, push the stick and hit the turns every time. However, Bosconion is an eight direction game so diagonal movement is lost. Still playable, its just a feature not carried over from the Arcade. The plastic stops are a similar design to the gamecube stick stops. A dremel can be used to round out the stops to gain back diagonal movement in Bosconion. The Arcade games include Galaga, Mappy, Ms Pacman, Pole Position, and Xevious. Unlike volume one, this unit does allow for eight direction movement. Ms Pacman still plays well without the four position detent, just push the stick at the correct angle. At first it seems as if Pole Position does not steer. The stick has a twist feature that works as the steering wheel. I do fear that Jakks Pacific will be fielding a ton of consumer related phone calls because of the conversion of Pole Position. It's hard to believe, but the joystick actually contains an excellent, but well disguised feature: spring-loaded analog rotation. To drive the car in Pole Position, players simply "twist" the spring-loaded stick clockwise or counterclockwise, making this conversion the best controlling Pole Position outside of the arcade. But the documentation doesn't explain this control well, and the joystick really hides its "twistibility" well, so many owners might feel they've got a defective controller since pushing left and right on the joystick won't make the car steer. In a real car when driving a stick, you have to release the gas pedal, push in the clutch and shift gears. Okay where am I going with this? One of my Namco TV games has a fire button only works intermittently. The larger fire button also starts each game. I took it apart and discovered all the switches are very nice miniature limit switches, just like the original Arcade in a shrunken form. The fire button limit switch top was rubbed out from heavy use. An exact replacement would be hard to find. I could try to get a regular momentary switch to fit under the large button. But it would not have the nice click of the original limit switch. I traded the good switch over to the larger fire button and wired both A and B buttons to the one good switch. Only two of the games require a second Fire Button, but I found a nice workaround. Two games were affected which added a change to the game play. Pole Position - Momentary release "gas pedal", then press again to upshift and downshift. Xevious - Both shoot and bomb are now single button. No big deal with unlimited ammo. Pole Position works beautiful, a simple twist of the stick to steer. With the single button combo mod, I now "Pop the Clutch" to shift gears! 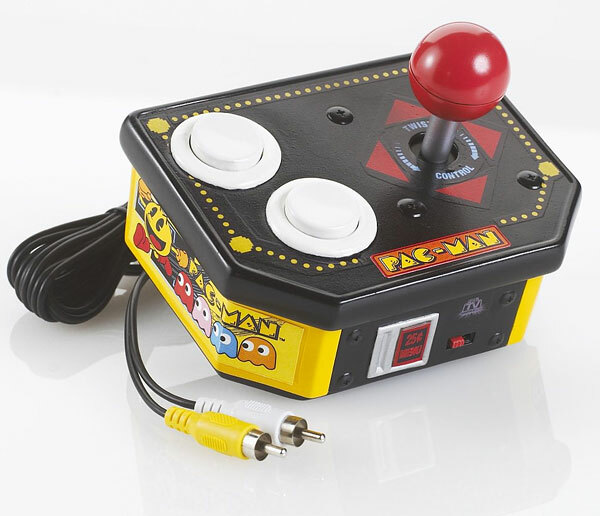 This portable stick includes Pacman, Pac & Pal, Pacman Plus and Super Pacman. It has a light up Coin Return Button in the front which indicates power on, click to return to the game menu. 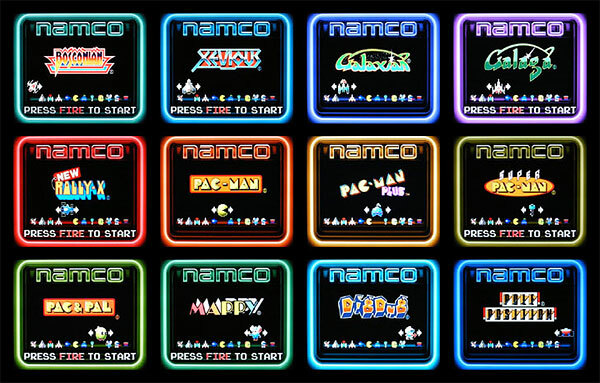 A nice feature is Super Pacman saves High Scores and has a "diamond" four way switch like the Jaks Namco Volume 1 Edition. This time unlike the slip up on Bosconion, all four games are four directions only. Note the Pacman character on the joystick ball, a nice touch. There are six Jaks NAMCO editions, I have three so far. I'm lacking the GameKey editions: wireless Ms Pacman, Pacman Gold and Retro Arcade. I don't know why Jr Pacman didn't appear on any of the Jak series. Newer ones have additional games, wireless stick and game keys. There are also Plug n Play controllers for various consoles including Sega Genesis, Atari 2600 and Nintendo NES. Bootleg Famicolm Sticks are preloaded with various NES games. If you don't mind a bootleg, its worth looking into for acquiring the elusive recalled game Tengen Tetris. Some TV Games are even hackable, one in particular is the Commodore 64 DTV. The stick comes with a mix of EPYX and Hewson games that originally were availabe on Tape, Floppy or Cart on the Commodore 64. The official games for the unit are mostly a mix of Epyx and Hewson C64 games. Games unique to the NTSC or PAL versions are noted below. The real gold of the C64 DTV is the PCB connections inside. The stick has solder pads for a keyboard, 1541 disk drive, external joysticks and even a SD card. For those that don't know the C64 DTV is a joystick that connects directly to your TV and emulates a Commodore 64 computer with 30 games burned onto it's internal ROM. It was produced for 2 years between 2004 and 2006. A while back I acquired one off ebay, with the intention of modifying it. Inside the DTV there are labeled solder points to connect a PS/2 keyboard and IEC lines to connect a Commodore 1541 drive. There is quiet a deal of information on the web on how to modify one of these, and I've been wanting to give it a try. One problem of buying used portable games is the missing battery cover. This is easily fixed by trimming out a piece of plastic from a DVD case. Since the DVD case is malleable compared to a stiff jewel case, it is easily cut with good scissors. Black is common but there are various colors including white Wii discarded cases. In the case of the Namco TV Games, a screw holds the cover in place. Last edited by CRTGAMER on Wed Jan 17, 2018 12:08 pm, edited 8 times in total. Oh I had to rediscover this one! Simon came out the same year as my mystery game posted above. Simple and addicting gameplay, so intuitive anyone no matter what age can pick it up and start playing. There is also the historic milestone of this "kids toy" built in 1978. Most know the story about the battle over who is really the Father of Video Games, so bear with me as I add another perspective with the Simon game. There were earlier main frame computer games but it was Ralph Baer who invented the first home video game console. It was called the Brown Box and included the very first Lightgun in 1966. Magnavox licensed the first console which became the Magnavox Odyssey in 1971. Nolan Busnell attended a demonstration show of the Odyssey, and with the help of Al Acorn built the arcade game Pong. A few years later the Atari VCS was produced, all inspired from Ralph Baer's Brown Box invention of 1968. Nolan Bushnell proclaimed to be the Father of Video Games, in reality it is Baer in 1966 and engineers in 1958 who made a tennis game in an oscilloscope. The Odyssey initially did well until the Atari VCS took over, a bit of irony considering it was Ralph Baer who invented the home video console. Revenge is sweet as Ralph got his turn after attending a show featuring Atari's Touch Me Arcade. Just as Nolan Busnell improved upon the Odyssey to build the Atari VCS, Ralph Baer improved the Touch Me Arcade to create SIMON. Noticing the success of Simon, Atari tried to market a Touch Me home edition but it was thought to be a copy of the Simon game. It could not compete with Simon which has bright colored lights and better sounds. This all took place in 1978 and here today in 2011 one can still buy a Simon game. Atari Corporation is just a memory with emulation, compilation discs and flashback remakes. Atari's handheld does have a few things going for it. For starters, there's an LCD to keep track of score. The 'skill' button is used to choose lengths of 8/16/32/99 for games 1 and 3, or 8/16/32 presses for game 2. Game 1 is the standard mode, starting at one button and subsequently adds one for every successful iteration. Game 2 is a little different, requiring the player to choose every other button added to the sequence. Game 3 plays like an elimination mode. When one of the 2-4 players either misses their turn or hits a button out of order, they're eliminated and that button is disabled. The sole survivor is the winner, and is rewarded with a raspy rendition of "We are the Champions." How cool would that be. You can still get a Simon today with newer types of gameplay and neon pastel colored lights. I find the original 1978 model as the best. Maybe the basic colors and sounds draw the nostalgia in me? The original prototype, built by Baer, included the Texas Instruments TMS 1000 microprocessor chip, which was low cost and used by many games of the 1970s. Lenny Cope, who was one of Ralph H. Baer’s partners, worked on the programming code for the core of the game, titled Follow Me at the time. Baer developed the tones of the game, inspired by the notes of a bugle. It was when they pitched the demo, an 8-inch-by-8-inch console, to the Milton Bradley Company that the name of the game was changed to Simon. Simon is named for the simple children's game of Simon Says, but the gameplay is based on Atari's unpopular Touch Me arcade game from 1974. Simon differs from Touch Me in that the Touch Me buttons were all the same color (black) and the sounds it produced were harsh and grating. Match the light pattern and sounds. There are three Game Modes. There is a fourth mode for expert players, repeat the sounds without looking at the lights. Four Skill Levels : Complete the game in 8, 14, 20 or 31 sequences. There is also Super Simon which came out in 1980. It has a head to head mode and random flashing lights to throw your memory off. For late 1970s technology, a lot of thought was put into Simon. There is even a spare bulb INSIDE the system. Simple and ingenious method to always have the spare bulb on hand. A nice bonus to help the sales of Simon was the movie Close Encounters of the Third Kind which released almost the same time. Kids would try to repeat the musical call notes from the Steven Spielberg movie. Even the Simon disc shape seems like a flying saucer. A luck of two unrelated items that complimented each other. Ironic the newer Yellow Simon mimics sound of the Yellow Portable Atari Touch Me. My Close Encounter of SIMON, LASER DISC and DVD. Last edited by CRTGAMER on Tue May 27, 2014 9:02 am, edited 17 times in total. Forgot my prized handheld. Everyone had football, I wanted Space Wars in my pocket, well a shooter at least. I think mine just says SPACE ALERT, now where did I put this! I will tear this house apart to find my first handheld. Months later - Guess what 1978 game I rediscovered, found stored in a box in my washroom. I was seeing stars when I battled looking for this one in the past year. I finally found my first Electronic Handheld game owned since bought brand new in 1978. 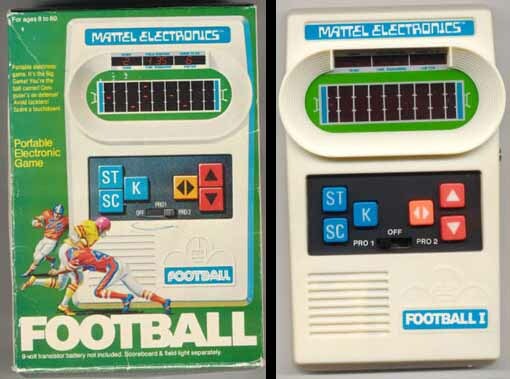 Everyone back then seemed to own Mattel Football, but I didn't care too much for sports games. I always preferred playing Space Theme style games at the Arcade. Games such as Space War, Asteroids, Blasto, Space Invaders, Rip Off and all the various Vector Space games of the day. I spotted the black handheld with the nice contrasting red LED screen. It was also smaller then Football for a better fit in the pants pocket. When I bought this game there was Space Alert or Battlestar Galactica Space Alert to choose from. Both were identical games, so I picked the TV tie in version thinking it might be worth more. Even back then I had a collector mentality in me, I guess from the comic book collecting experiences. If only there was the Internet back then to research game values! Unfortunately Space Alert without the Battlestar Galactica logo was the rare title, having a much shorter run. These were preceded by an even more rare version titled Missile Attack. However, even the Battlestar Galactica version is uncommon compared to Mattel Football. Missile Attack was released in 1977, (I had originally been told that this was the first one that they released, but it actually followed Auto Race and Football, this has been confirmed both by the programmer of Auto Race and Football (Mark Lesser) and one of the project engineers of the first games (Gary Cummings)). I believe Missile Attack was listed in the 1977 Sears catalog. It was quickly withdrawn from distribution (and later resold as Battlestar Galactica) because NBC refused to air the TV commercials for the game. The little city at the bottom (that the missile's are attacking) is actually an outline of New York City, and people at NBC were concerned about the impact it would have on children to think that New York's 8 million inhabitants would be dead if they lost the game. (Remember, this was the late 70's, and we weren't all being made insensitive to violence by seeing it on TV and movies every day. And being in the middle of the cold war didn't help either... Thanks to Howard Cohen (ex-Mattel employee) for this great story! 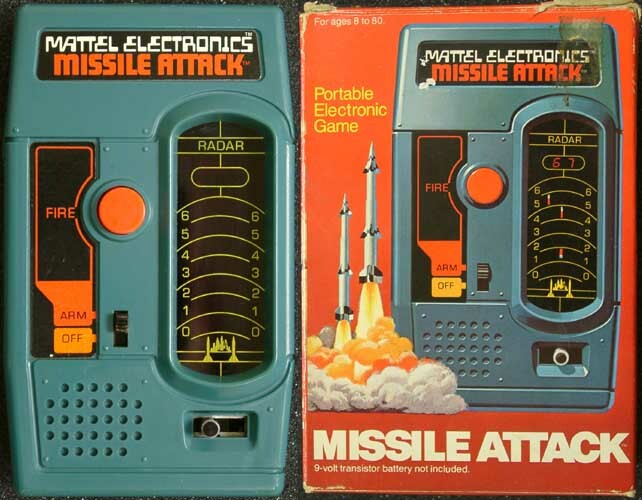 Some variations: First one only says Space Alert on the game itself (the game does look exactly like the picture on the box), second is the original Missile Attack box. 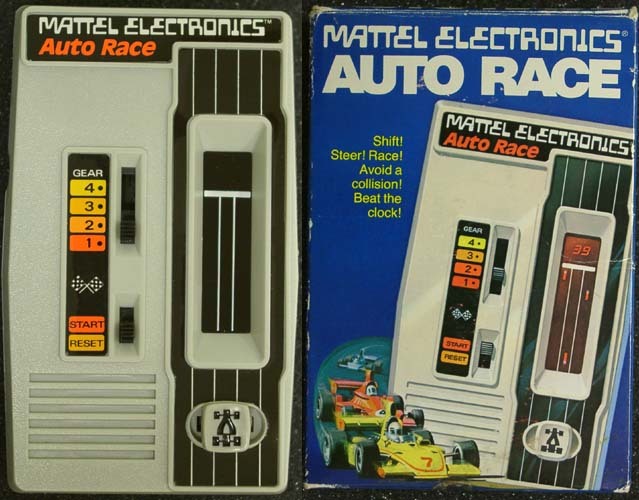 I also remember Mattel Auto Race on the store shelf, the very first Portable Electronic Handheld. But it was also a Sports type of game like Mattel Football, so I passed it up. A regret now of not buying one back then. Both Auto Race and Space Alert uses the stick to move left and right. In Auto Race you would dodge the blips which represented the other cars on the track. There is a YouTube link in the OP for Auto Race. Note the little car stick, only Auto Race and Space Alert has the slide stick function. Space Alert played the opposite of Auto Race, instead of dodging the blips you try to hit them. Press the Fire Button and move the stick. The idea is to protect the center bottom of the screen from incoming fire. Staying at the bottom does not work, you have to fire at the targets flying down the screen. Unlike all the Mattel Sports games with slower strategy pacing, this game is a fast no time to think reaction shooting game! The blips would sometimes shift sideways as they drop, at even at times rain down in pairs. The higher up the targets are hit the better the score. The score ranges from one point at the bottom to six points at the top of the "Radar Range" scale. After you survive twenty attacks you get an all clear tone. If your ship gets hit at the bottom, taps is played. 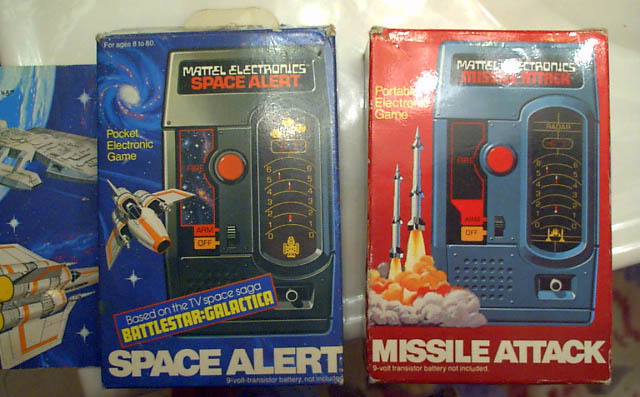 The Missile Attack - Battlestar Galactica Space Alert Electronic handheld played as a bottom shooter with attack waves and preceded the Arcade game Galaxian by two years. This makes the Mattel game the very first SHMUP in a portable electronic handheld. Considering the technology of the day, it really holds its own and is still fun to play. I also recently acquired Mattel Basketball for a two dollars at the Thrift store. It is the remake classic version, but unlike the Mattel Football LCD remake this one does have real LEDs as the player blips. The scoreboard has a miniature LCD screen. Move your player into position then press the Basketball Blue Button to shoot the ball. If another opponent blip is in line of your shot, they grab the ball. You have to grab the ball blip back by blocking before the opponent reaches the bottom of the screen. Note that all the Mattel games have bright colored buttons, a trademark of the late 70s and 80s. The Sports games have a multi ridged frame around the LED playfield that represented bleachers of a sports stadium. Handheld Museum wrote: This is latest re-release from Mattel. This time Basketball gets the honors. I haven't played it extensively yet, but it does pretty good. Like the Baseball re-release, the play field is actual LEDs, and the score board is a back-lit LCD panel. They've actually changed this game a little and added a 3-point shot, based on the actual rules of basketball. They've also added a switch for turning off the sound. It is packaged with batteries and turned on from the factory, and it has a power save feature that will turn the game off after a few minutes. 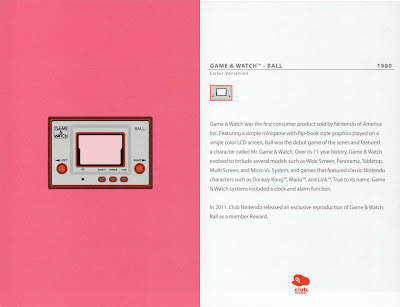 The MATTEL portable games are the first, having beat Gameboy, Turbo Express, Lynx and even the old Gamewatch series. The technology of the day only had red LED blips for players, balls, missiles and spaceships. Score displays though limited were impressive for sports games, keeping track of yardage, scores, downs to go and time left in a game. The limited display was made up with that just one more quarter incentive of the Arcades, the GAMEPLAY to make you want to try just one more time. So which Mattel Handheld do I like the best? I like the sports games but Space Alert is still my favorite. Maybe because I have owned this since 1978? One of the LEDs on the scores is burned out and the Fire button and bottom have some wear. But the game still works perfect and plays just as good as the day I bought it! Besides, its also a kick to see other reactions. Imagine the looks I get while standing in line at Gamestop, the beeping noises with this or one of my other Mattel Handhelds. A TV Remote Control multiple holder makes a great Portable Game holder. Top Row: Basketball Classic 2003 and Football Classic 2000. Last edited by CRTGAMER on Wed Feb 08, 2017 11:56 pm, edited 5 times in total. 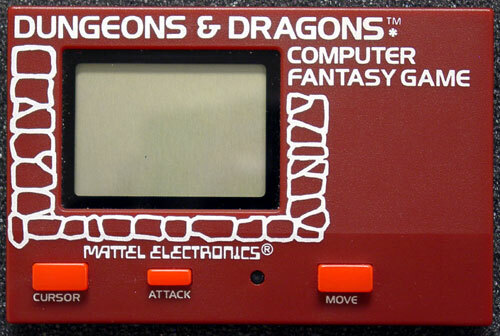 It's a DnD handheld electronic game... Unfortunately, that's all I know. I'm dying to play this game as I like to collect DnD video games. If anybody has one- let me know! I want to play this and would gladly put up a detailed post about it! There are numerous Plug n Plays from the far east. Most tend to be filled with pirated Famicom games. Probably the least expensive way to discover Japanese Nintendo games. It is also a great way to play uncommon expensive games such as Tengen Tetris. In addition, discover hacks of different games to try and play in a new way. Some Import Plug n Plays come with new "homebrew" games with similar NES style graphics. PowerJoy and SuperJoy are known for a basic N64 look alike controller with bootleg Famicom games. Some come with a separate Lightgun. This model has a Lightgun sensor built in at the top. The best feature is the systems that have a separate Game Cart and Famicom Port. You can do two very special things with this type of gaming system. 1. Pop in a Famicom cart to the slot, use it as a very inexpensive Famicom console. 2. Plug the bootleg multi game PCB into a Gyromite Import Adapter and play the bootleg games on a NES. This gives an authentic feel to the Famicom games, choose a different game with a simple press of the reset Button. No need to swap carts for a different game. CRTGAMER wrote: Bootleg carts are great way to discover a rare hidden Gem or an obscure Import. In play testing the Famicom Mobile II with a bootleg console cart, I discovered another great import game. Ever hear of Quarth? On the Supervision bootleg cart its called Shoting Bloc. A reverse Tetris using a Spaceship SHMUP style to fill in the Tetris blocks. Released in multiple platforms in Japan as well as in the Arcades, the U.S only got portable versions on the Gameboy and DS. The back of the Powerjoy cart indicates a translation to English: "Since this is a sophisticated apparatus should avoid to operate or to store under extreme temperature, also avoid violent bumps is necessary; moreover, never disassemble it. The reasons causing dofauts are: Touching the end field by hands, or cleaning by wet materials." Another PowerJoy, this time with huge sticks. The base has suction cups which frees the hands to control the stick and buttons. All the games seem new again with NES style graphics. At the base, the left four buttons are for power and game menu functions. The right four buttons are used in the games, two are Rapid fire. The stick also has two fire buttons. I was surprised by how responsive the stick is. A simple light pull gives a good response in changing directions. The buttons also have a nice touch. No Arcade stick here, but not bad for the games it is designed for. Dejectile - Bomberman clone with scrolling screen. Snowball - Push snowballs into holes, a Sokobaun clone. Finger DDR - No kidding! Match the arrows, DDR Samurai song. Pulveration - Take the NES tank game and add graphics and autofire. Burrow Explorer - Reminds me of old dungeon games, light up the passages. Teleport - Maze game, teleport to different areas to collect the hearts. Addicting! A lot of inspired clones on the cart. Unfortunately the navigator game cart will not work in a NES with a Gyromite Import adaptor. A shame, some of the games would have been interesting to try out in a NES. Ah well, one more go at the game Teleport with the stick. There are other OneBus Famiclones with cart slots, if you want to try that cart and fancy tracking one down - I know of Power Joy Supermax, Generation NEX (apparently), EZi/WiWi (87-game version only), Mega Arcade Action, a bunch of recent Subor consoles, Factor 5 & FC3plus, there are probably way more out there. The latter two have NES style 72-pin slots so you'd have to use an adapter (but honestly i'm not sure if conventional adapters work with OneBus carts), all the rest are 60-pin. Incidentally, every console I listed apart from the Power Joys and the Mega Arcade Action is VT03-based, not VT02 - the VT03 adds support for 16 colours per tile instead of 4, among other enhancements. Not really an Import since it is officially sponsored to sell in the states, but similar in design. I was always curious about this one, having seen the silver one at Wallymart. The game graphics are similar to a NES but none appear to be pirated. Again all seem like new games in NES style graphics with some that pay homage to older Retro games. Designed to match the portable DVD player, the connectors have mini plugs instead of regular RCA cables. This is easily remedied with adaptors. As in the Navigator cart, the games cannot be transfered to play in a NES console. The Import Plug n Plays have games that are reminiscent of the NES. Most of the games are similar with a variety of Platformers, SHMUPS and Puzzle games. Searching thru the game menus will sometimes turn up an unusual game. This make it worth trying each game thoroughly, discovering how to play to uncover a hidden gem. Last edited by CRTGAMER on Wed Mar 13, 2013 5:15 pm, edited 5 times in total. There are numerous Atari emulators and game compilations for various systems. I'll breeze thru the various "Hardware" style classic Atari renditions. 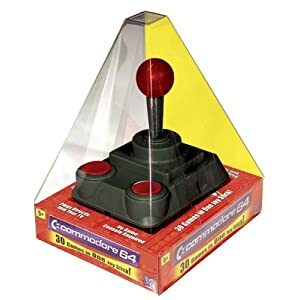 Designed to look like the original Atari 2600 Joystick. The ten games are: Adventure, Asteroids, Breakout, Centipede, Circus Atari, Gravitar, Missile Command, Pong, Real Sports Volleyball, and Yar's Revenge. Designed to look like the Atari 2600 Paddle. There are one and two player versions of the Jaks Paddles. The eleven 2600 games are: Breakout, Casino, Circus Atari, Canyon Bomber, Demons to Diamonds, Night Driver, Steeple Chase, Street Racer, Super Breakout, Video Olympics and Warlords. The two Arcade games are Pong and Warlords. The menu works pretty well in selecting a game or difficulty level. Nice that each Atari cart has a skip to each style game, but disappointing that Video Olympics only has two games available. 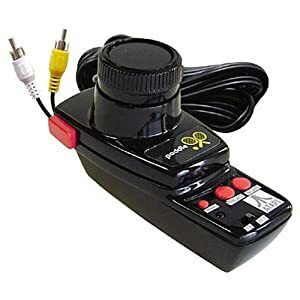 This is the best "console" for atari paddle games and notably Arcade Pong and Warlords, easy composite hookup with a very nice solid spinner. Two flavors of controllers, a Yellow Game Pad and a Tac 2 look alike joystick. The joystick version is tight with good response. The ten games are: Barnstorming, Chopper Command, Fishing Derby, Frostbite, Kaboom, Pitfall II, Pressure Cooking, Robot Tank, Seaquest and Spider Fighter. Kaboom is actually playable with the joystick. The color stripe around the base is soooo 70s. 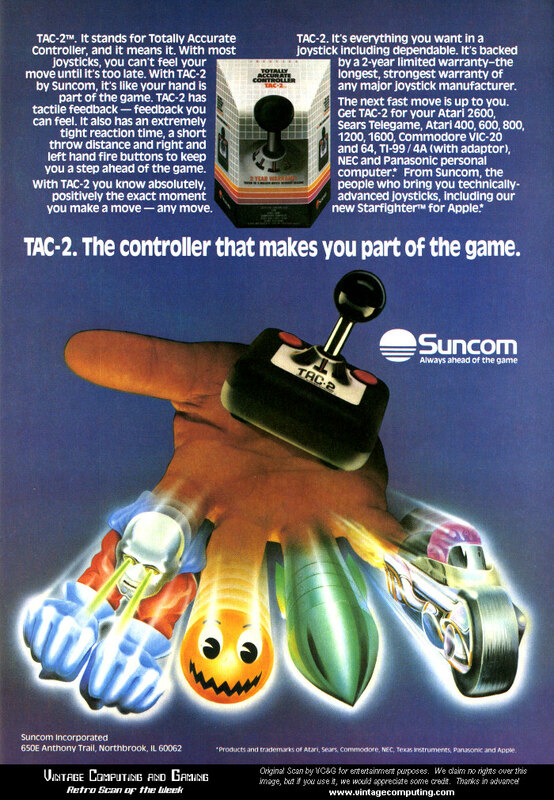 Note the joystick is really not that small as alluded by the ad. It is similar in size to the Atari 2600 Joystick. The Slik Stik also by Suncom is that small. The first of the Flashback series, this has an appearance similar to the Atari 7800 console. Designed by Atari veteran Curt Vendel of Legacy Engineering. The Joyports are standard 9 pin but will not work with regular Atari 2600 controllers due to a difference of the internal wiring layout. The small joysticks follow the design of the Atari 5200 and 7800 and has a Pause button to pause all the 7800 as well as the 2600 games. Fifteen 2600 games: Adventure, Air Sea Battle, Battlezone, Breakout, Canyon Bomber, Crystal Castles, Gravitar, Haunted House, Millipede, Saboteur, Sky Diver, Solaris, Sprintmaster, Warlords, Yars Revenge. 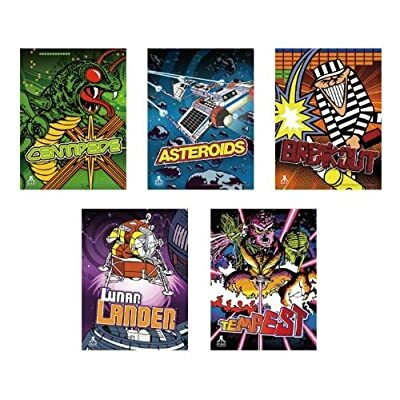 Five 7800 Games: Asteroids, Centipede, Desert Falcon, Food Fight, Planet Smashers. 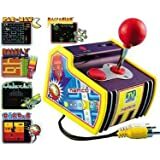 This console is unique to include 7800 games including the rare 7800 Planet Smashers game. The emulation is not perfect, but not bad either. Disappointing that no Atari joystick will work, only the Flashback tiny sticks. Interesting that both the Flashback and 2600 consoles both utilize 9 volts DC. Designed to look like the original Atari 2600 wood grain console, built by ATGames. Funny that the front went black just like the 2600 Vader model, maybe a subtle coloring to pay homage? A very nice feature is the mini console has joyports for any Atari 2600 Joystick, Trakball or Paddles. The Joyports are in a smart location, right in the front of the console. Strange that they are upside down compared to any other console and computer nine pin joyport. Not an issue since any vintage 2600 joystick plugs in just fine. The real jewels are the Prototype Unreleased and Home Brew Hack games. 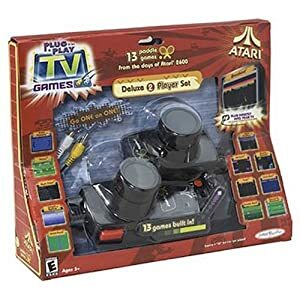 The sixty games include: 3D Tic-Tac-Toe, Adventure, Adventure II, Air Sea Battle, Aquaventure, Asteroids, Backgammon, Basketball, Battlezone, Bowling, Canyon Bomber, Centipede, Championship Soccer, Circus Atari, Combat, Combat 2, Demons to Diamonds, Desert Falcon, Dodge 'Em, Double Dunk, Fatal Run, Flag Capture, Frog Pond, Fun with Numbers, Golf, Gravitar, Hangman, Haunted House, Home Run, Human Cannonball, Maze Craze, Miniature Golf, Missile Command, Night Driver, Off the Wall, Outlaw, Realsports Baseball, Realsports Basketball, Realsports Soccer, Realsports Volleyball, Saboteur, Save Mary, Secret Quest, Sky Diver, Space War, Sprintmaster, Star Ship, Steeplechase, Submarine Commander, Super Baseball, Super Breakout, Super Football, Surround, Swordquest: Earthworld, Swordquest: Fireworld, Video Checkers, Video Chess, Video Pinball, Wizard, Yars' Revenge. CRTGAMER wrote: Be careful, unlike the older Flashbacks, Flashback 3 and 4 takes a lower 5 VOLT POWER PLUG. 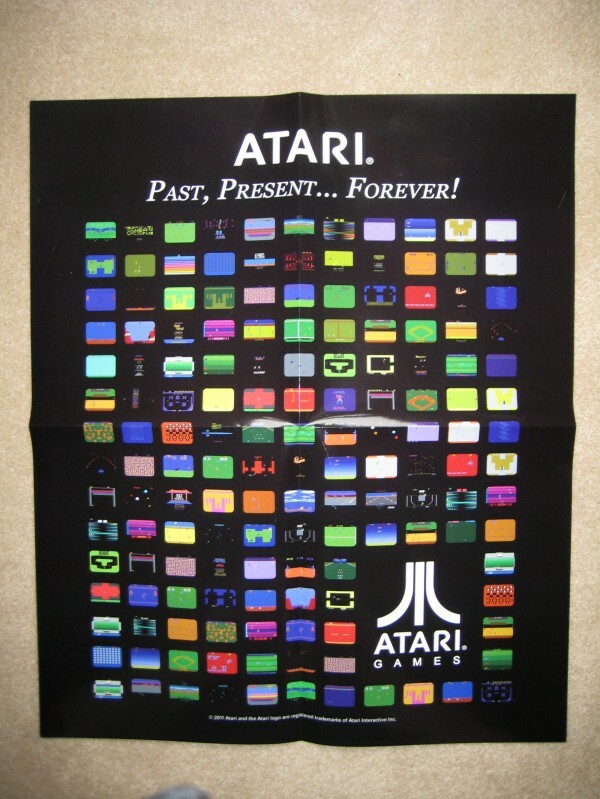 The Flashback 3 comes with a limited edition Atari poster. Looks very similar to Flashback 3 and also built by AtGames. This company also built a Sega Genesis console PlugnPlay which I will cover later on. Just like the previous model, Flashback 4 comes with a bonus poster. This time a rendition of the Arcade side art panel, Asteroids. 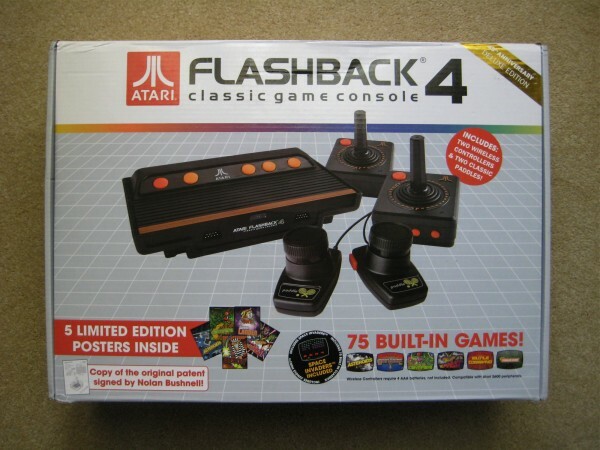 To celebrate Atari's 40th anniversary, the Flashback 4 also has been released as a Deluxe edition which includes five posters, schematic patent sheets of the original Atari and a bonus set of new Atari Game Paddles. Some of the new games include Home Brews and unfinished official Betas. Return to Haunted House offers new levels to Haunted House, but the rolling eyes are gone. Tempest is also included, though it is an incomplete beta. Not a bad game but nowhere near as Atari Age 5200 Tempest which was completed by the original programmer. One of my favorite vintage strategy games made it to Flashback 4, Stellar Track! Based on an older game called Super Star Trek played on main frame computers back in the day. This game is one of the three exclusive Telegames games that was released by Sears only. Quite a bit more rare than the VCS edition of Sega’s Star Trek arcade game is this Sears exclusive. It’s interesting to see what Atari/Sears did and didn’t get away with. The game was renamed because Paramount wouldn’t give permission to base it on the TV show, and yet the game clearly makes reference to Starfleet, stardates, photons and “phasors.” And the shape of the ship in the minimal graphics is slightly suggestive of an overhead view A dimeof the classic Enterprise. Stellar Track was programmed by Atari but was only released under the Sear Tele-Games label as one of three exclusives. 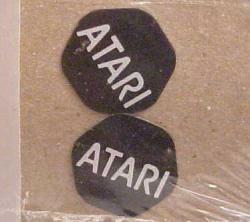 This was part of the deal Sears made with Atari when it agreed to start distributing their games under it's own label. While Stellar Track was vastly overshadowed by the flashier action games of the time, it remains one of the few true strategy games on the 2600. Stellar Track is a little slow paced, but worth a try. Slot Racers is also a nice addition, a great two player battle game much faster then Combat. The Pong game is not the Arcade version as in Flashback 3 but now what looks to be a level from the Video Olympics 2600 cart. Space Invaders is also included, but it is different from the 2600 or Arcade version. The 2600 game cart has unique levels such as hidden invaders that appear when you shoot. Wireless joysticks are included with the Flashback 4. These require a direct line of sight with the infra receiver instead of using better wireless transmitters. This is not too bad as long as the joystick is held facing the console. Player one joystick includes extra buttons to get back to the Menu and start a new game. Any wired 2600 joystick or 2600 paddle can be as well. This includes 3rd party Joysticks including Wico, Suncom and EPYX which is my facorite. Strange that the game ports are upside down, but they are in the front of the console for easier access. 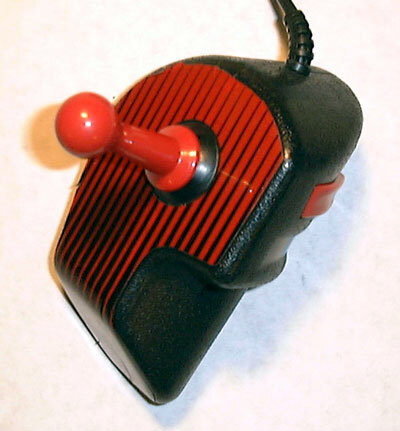 The 2600 Paddle Buttons are the same as the left and right control of Atari 2600 Joystick. This can be made to work for sideways control of driving or overhead shooting games that normally use a joystick. Now if there were a way to access the fire button of the joystick. Combine both the Joystick and Paddles with a Y cable, I found a very nice way to play a particular Pinball game. Nice to discover something new on a decades old system! I saved the best Flashback console to review for last, built by Legacy Engineering. Older then Flashback 3 and also designed to look like the original Atari 2600 wood grain model. 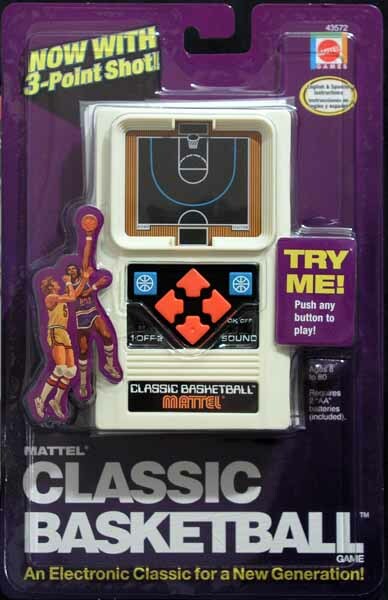 Just like the Flashback 3 and 4, this also has joyports for any original Atari 2600 Joystick, Trakball or Paddles. Again, the jewels are the Prototype and Home Brew hack games. Look for Quad Run with a real voice, exclusive Yars Return, Asteroids with vector lines of the Arcade and the addicting game Save Mary. Just like the original Atari, the Flashback 3 also uses 9volts DC. I am really surprised by the accuracy of the Flashback 2 joystick. It maintains the look and feel of the original, yet the contacts hit easily every time. A very nice joystick. The console also includes two hidden titles which require the use of paddle controllers. 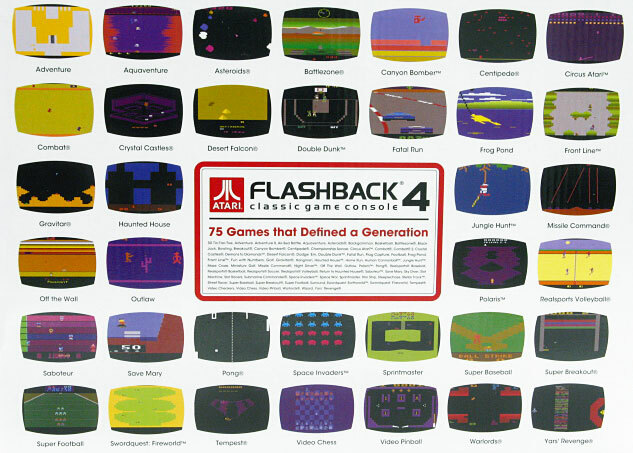 The Flashback 2 does not come with paddle controllers, so these games cannot be played unless the user has an original set of Atari 2600 paddle controllers. To access the hidden paddle game menu, the user must press up on the joystick 1 time, pull down 9 times, push up 7 times, and pull down 2 times (this represents the year 1972, in which Pong first appeared). The code must be entered steadily and without pauses (enter it too quickly and it won't work). Right Click for a larger image. If there is one Atari PlugnPlay to buy, make it this one. It is the only Atari PlugnPlay that uses real coding to simulate a real Atari 2600. It has a "2600 on Chip" which gives perfect emulation. Curt Vendel and Legacy Engineering returned to develop the Flashback 2. Unlike the original Flashback console, the Flashback 2 contains a single-chip version of circuitry designed by Vendel; it is a reproduction of the original circuitry in that of the original Atari 2600. Therefore, the Atari Flashback 2 runs games just as they ran on an original console. The bulk of the included games in the Atari Flashback 2+ are the same. However, Pitfall, River Raid, Wizard, Caverns of Mars, and Atari Climber have been removed. In exchange, a sports section was added that included the games Realsports Boxing, Realsports Soccer, Super Baseball, Super Football, and Double Dunk. A third hidden game, Circus Atari, was added to the hidden menu that features the paddle-controller only games Warlords and Super Breakout. Aside from the games, the cosmetic differences between the FB2 and the newer FB2+ are that the latter console sports a plus (+) sign and larger text for "Classic Gaming Console". Also the 'fuji' Atari symbol on the original FB2 resembles the newer Hasbro-era fuji, whereas the FB2+ fuji resembles the original Atari fuji of the 1970s. Did I say emulation? 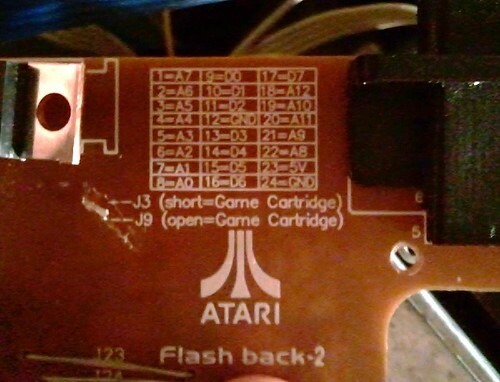 The chip on the Flashback 2 PCB is so accurate that the console can be modded to take real Atari 2600 carts! The designers even included pads to solder up a cart connector. Fastbilly and I are both looking into modding a Flashback 2. CRTGAMER wrote: The soldering can be tricky from looking at the size of the pads. I think the top cart connecter dust shield spreader will be the biggest headache. An alignment issue yet maintaining a clean look to the top of the Flashback or adding a plug in project box using a cable connector of some sort. Maybe an IDE cable that is not flat? The Atari just has good, fast to play, games. And the graphics scale well to projector sizes. I am half tempted to make it a side box that plugs into a port on the side. That way the console still looks good, and if we just want to play Combat, we just pull out the console itself. But if we want to play Tennis, we can pull out the pod. 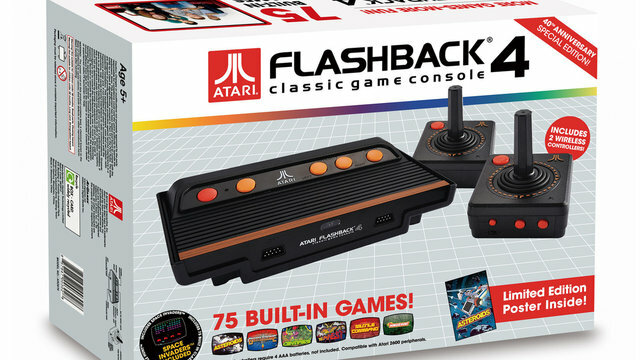 The Flashback 2 is the one to get since it has an Atari on Chip and the 2600 cart mod option. The first Atari Flashback has the advantage of a couple of 7800 games, but no support for any other 2600 controller. It is also the most compact of the three. The emulation, though not perfect is passable. The Flashback 3 and 4 also uses emulation, but actually is quite good. Again not as good as the Flashback 2 or a 2600. The Flashback 3 has a larger built in library, a gain of added twenty games over the Flashback 2. However, a few titles are dropped, notably the new homebrew version Yars Return. Flashback 4 added another 15 games, but removed the last Atari 2600 game made off its library, Nolan Busnell's Secret Quest. 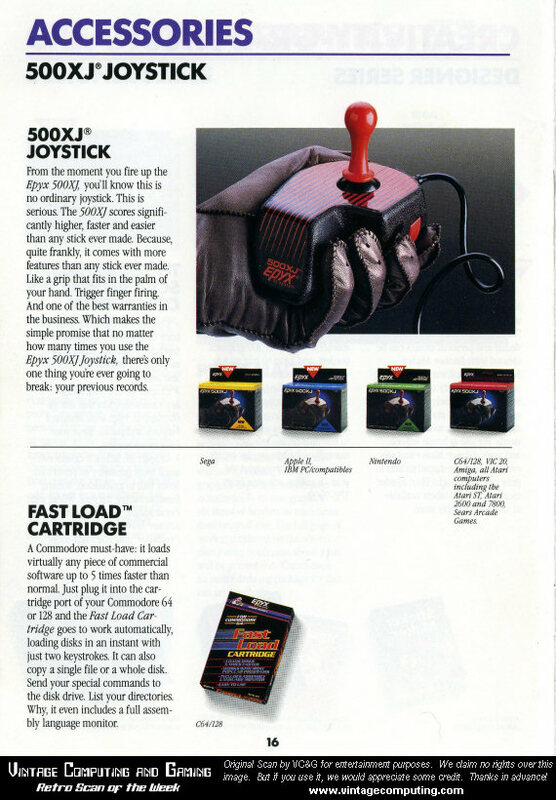 Flashback 1 uses miniature joysticks modeled after the 7800. Though tiny they work reasonably well and are more comfortable to operate then official 7800 controllers. 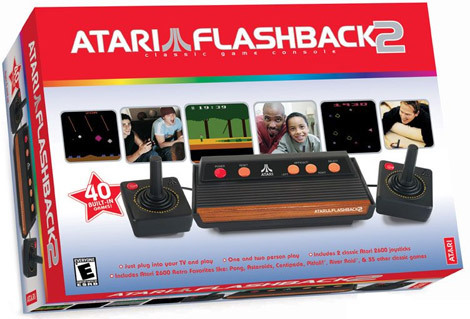 Flashback 2 and 3 uses joysticks modeled after the Atari 2600. Flashback 4 uses a wireles version modeled after the 2600. 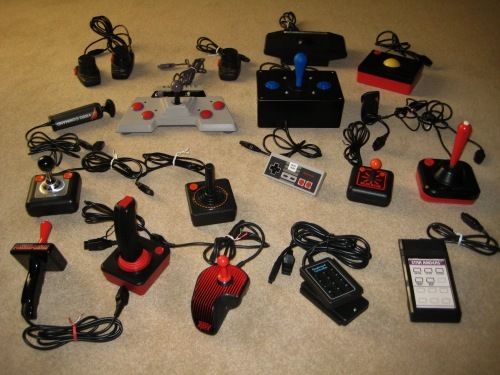 I compared all of these to an original Atari 2600 CX40 Joystick. I do not have a CX10 Joystick which has the reputation of better control then the CX40. 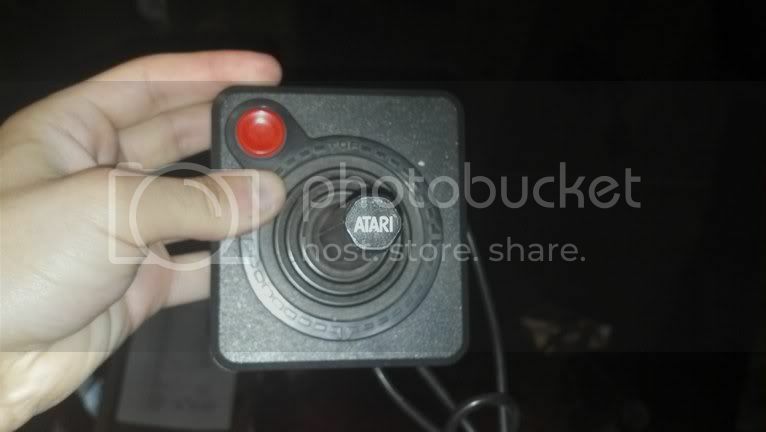 CX10 Joysticks have an indentation on the top with an Atari sticker logo attached. 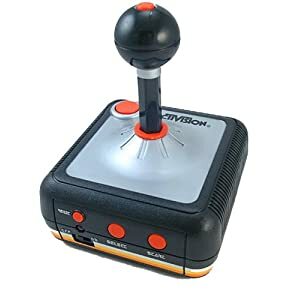 I tested all four styles Joysticks which are identical in size and like the Atari Flashback units better then the original. Maybe because the CX40 is from the 70s and has wear? 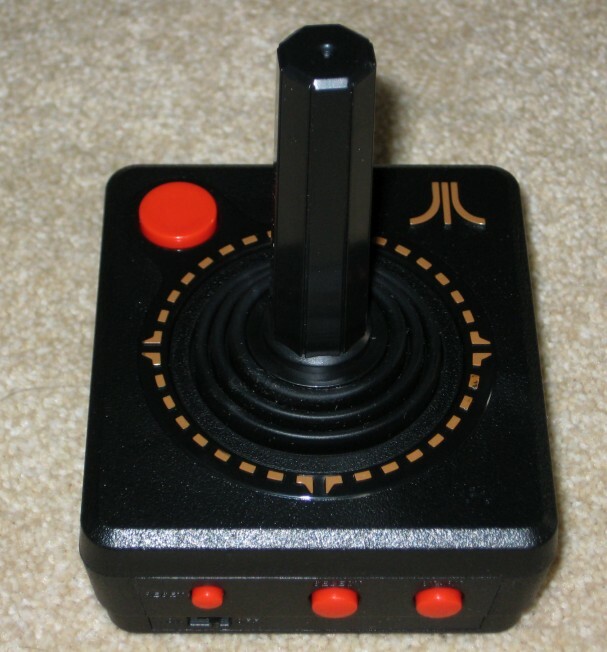 Even back in the day I never cared for the sloppiness of an Atari stick, used a Wico or EPYX Joystick instead. The Flashback 3 has a nice travel with solid hits, but none of the Atari joysticks have the nice tactical click of an EPYX 500XJ. 2600 CX40 - Longest travel, sloppy hit on the contacts. Flashback 2 - Short travel, but not too short. Nice hit of contacts. Flashback 3 - Slightly longer travel then Flashback 2, nice hit of contacts. Flashback 4 - Same as Flashback 3 and now wireless, but needs a direct line of sight. 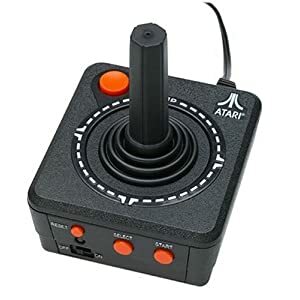 Any of the Flashback units are worth buying for anyone who would like to try Atari games and not invest in a lot of money or space of a 2600 Atari console. The wired Flashback 2 and Flashback 3 Joysticks can work in an original 2600, 7800 or Commodore 64 computer. The Flashback consoles have the advantage of a Composite hookup right out of the box, this is better then the RF signal of the original consoles. The Flashback PlugnPlays can be bought inexpensively at various outlets. At less then a cost of a current generation game and including the hardware along with two 2600 compatible Joysticks and a limited edition poster in the newer models, a bargain! A coincidence that both the Flashback and the original Atari 2600 uses a 9 volt DC power plug? The old Atari's take a mini "Mono Headphone" plug, I had to solder one on. Okay not really a PlugnPlay but the real thing. It is certainly small enough to be a compact PlugnPlay console. I have modded the Atari Jr for Composite output. I'll post the details of the mod here in this Thread soon, meanwhile a few teaser pics. Last edited by CRTGAMER on Sat Apr 27, 2013 4:59 pm, edited 52 times in total. A special thanks to Benjamin Heckendorn and Longhorn Engineer. Their sites have valuable information in not only the Atari 2600 Jr. Mod, but other projects as well. I followed Ben Heck's Guide and added a couple of changes. The Atari Jr is a compact console compared to the older versions. It can be used as a PlugnPlay but has to use the RF cable connection. There are Composite and SVideo mods that can be done. The SVideo cable will be the best signal, but as a PlugnPlay a composite connection is more durable. Read thru this entire post and research thru the links at the bottom. There are numerous ways to do the Composite mod, some are more costly and others require removing of parts. Your TV might also have affect of the video quality, some receive the converted signal better then others. CRTGAMER wrote: There may be a chance that not all your game carts will work, this depends on which mod is utilized and the TV that the Atari 2600 Jr. will be hooked up to. I tried three different mods, each having a different result. A fourth and fifth Mod includes a new chip, however this is more expensive. Mod 1 and 2 did not work for me, both resulted in no screen, just the audio worked on my TV. The TV tested is a standard definition small 15" CRT. A different TV may have worked, so these could be an option. I was careful in Mod 2 when desoldering parts that had to be removed. When Mod 2 did not work a reverse of resoldering the removed components. This allowed returning the 2600 back to its original RF state. I went with Mod 3 which I followed from Ben Heck's site. It has the advantage of two potentiometers for adjusting the video settings. This version of the Composite Mod has a minimal expense on parts and works with most games. Depending on the TV, there are a few games that might not work. There are two additional potentiometers that are installed so various games can be "tweaked" in. See my Reply above for the parts pic. 3. Drill and Drill Bits. 4. Pin Drill Set for the PCB. The Atari 2600 Jr. plastic is very brittle. Turn the console upside down then remove the five screws at the bottom. It is very likely a couple of the pegs might snap. Flip the 2600 Jr right side up. Be careful of the flex circuit for the upper cover buttons when removing the top cover. The flex circuit pulls right off. The PCB is not screwed in, remove it and flip it over. Next the Metal RF Interference Shield needs to be removed. Use a pair of needle nose pliers and straighten out ten lock tabs underneath. Try not to damage the shields, carefully remove the bottom, then straighten out the tabs for the smaller RF Modulator shield. Remove the upper shields, set all shields aside to be reinstalled later. See my reply above for a pic of the entire exposed PCB. There are two 1k potentiometers and one 22ohm resistor that will be added. These can be mounted on a separate small Circuit Peg board. 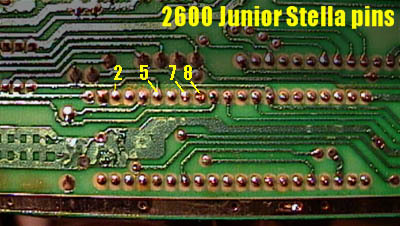 A better method is mounting the added parts right on the 2600 Jr PCB. This saves on mounting a separate board and excess wire. Taken further, wires can also be passed directly thru the PCB after soldered underneath. 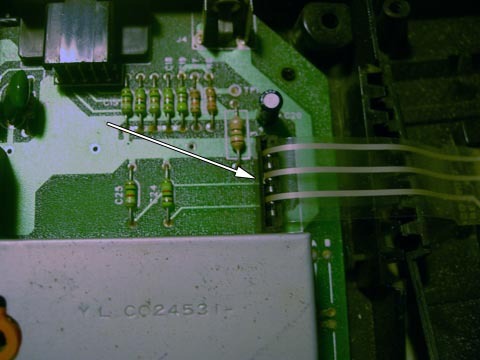 Locate an empty area that has no solder traces on either side of the PCB. I used the upper right corner of the PCB near the upper cover flex circuit connector. CRTGAMER wrote: A power drill might crack the PCB plastic, use a hand turned pin drill. Mark and carefully drill each hole starting with a tiny drill bit for a starter hole first. Be careful of the traces below. You can see in the pic where I accidentally drilled thru the edge of a trace underneath in the right pot location. I also drilled five extra small holes for video next to each other in an open area to accommodate the wire splice. Two extra holes for the ground and audio wires to pass thru. Two new Potentiometers on the left, additional holes and a new blue resistor to the right. When soldering wires I found it better to make all the connections from the bottom. All the solder pads underneath already have solder and there is less risk of frying a chip or resistor. A simple matter of following traces to match the wires. CRTGAMER wrote: Solder all connections from under the PCB. Pre "tin" the wire ends with a little solder before connecting to a solder point. While the wire end is warm, heat both the pad and wire for a good quick connection. This reduces heat damage risk to components on the other side of the PCB. 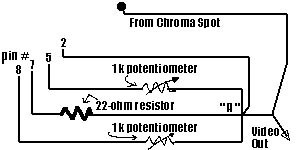 Locate the Chroma and Audio solder points. They are on the lower half of the PCB. Be sure to have enough wire to connect the other end. 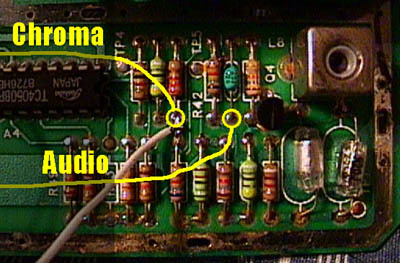 The audio wire has to be long enough to go thru the PCB pass thru hole and to where the RCA jack is located. Trace the resistor connections underneath, then solder the Audio and Chroma wires. Ben Heck wrote: FUN TIP: If you de-solder that little chip you see in the upper left hand corner of this picture, it will actually make the video signal better. Must be some sort of RF filter or something. The ground connection can be any point that the Metal Shield contacts. Follow to trace to a good solder point below. The Stella Chip is the bottom large chip on the PCB. Looking on the back the upper row of chip pegs is where the rest of the video wires will be connected. Be careful in counting the chip leg solder points, the far left pad is not one of them. There is a parallel chip leg to each pad below. Counting from left solder individual wires. At the other end of the wires, connect to these points. CRT GAMER wrote: The potentiometer connection is the middle prong and either end prong. It does not matter which wire goes where as long as just the middle and one end prong is used. The same for the resistor, either direction is fine. Note that Pin 6 can be substituted for Pin 8, I posted a pic of this in my previous Reply. On my TV, either connection has the same result. The wires are eventually all tied together. If you drilled the five holes on the PCB, then all the wires can be spliced together as one large solder pad point. An additional wire from the other side of the PCB also connects to the solder pad splice, it will be use to connect to the RCA jack. Note the black ground wire connection, anywhere there is a common trace back to the Metal Shield tabs are fine. In the pic, Black Wire is a common ground connection. Starting from the top row left White Wires, replacement parts each with two contact points; Resistor, Potentiometer, Common Splice and another Potentiometer. Bottom row is Red Audio and White Chroma from the resistor connections followed by Stella Chip leg connections 2, 5, 7 and 8. Find a suitable location for the RCA jacks. A lot of mods placed them on the side, but I wanted a cleaner look. I mounted the jacks on the lower half of the case for ease of top cover removal. I drilled two holes on either side of the power plug connector, One for Audio and one for Composite. CRTGAMER wrote: Be careful when drilling the holes. The console cover plastic is very brittle. Use a smaller drill bit first to make a starter hole. When drilling the larger hole, run the drill at full speed and go in very lightly so the drill bit will not catch the edges of the hole. Attach the Audio wire to the center of the White RCA jack and the Composite wire to the center of the Yellow RCA jack. Connect the ground wire to both RCA jacks outer tabs. 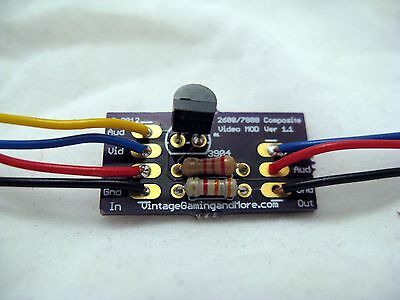 The white Composite Video wire is connected to a multiple wire bundle point right at the PCB with four wires soldered on the back side. The Red Audio and Black ground wires pass thru holes in the PCB to the bottom side solder points. The pass thru allows for a cleaner and more stable connection. The PCB can be rotated for installation or maintenance without straining the solder connections. I also reinstalled the RF Shield to provide a rigid structure for the console. Be careful that all the solder points underneath are clear and do not short out on the metal shield. The new Pots are bent down a little for easier access to adjust. The new blue 22ohm resistor is to the right. The RF Shield gives support, a skeleton for the brittle plastic shell. Leave the top cover off to test. You can start a game if the upper flex circuit is connected, be careful the upper cover is set on its side as not to pull the wires. Get a 3rd party cart such as Activision that does not have a dust shield. I used Chopper Command which has a blue sky and tan background. Pop the game cart in, hookup the Video and Audio cables and then the power cord. The left switch on the PCB is for Power, the right switch flipped up is color. Turn on the Atari 2600 Jr and keep fingers crossed. You can adjust the two newly install potentiometers to fine tune the pic. One will affect the horizontal roll, the other affects the brightness and side distortion. There is also an on board potentiometer to the left that affects the tint. Try different game carts, each might have to be tweaked until you can set a compromise for all to work. For dust cover Atari carts you will need to temporarily set the top cover in place. A pretty good hit rate, most of the game carts worked fine with a cleaner pic. Although some games appeared darker then when they were in RF. Unfortunately a couple of carts would not work, Haunted House has a Split Screen slow roll affect. It makes for a new way to explore the house in the dark. Once the adjustment tweaks are complete reinstall the cover. Ensure the flex circuit is plugged all the way in, align the power and color switches. Reinstall the five screws, or less if some pegs snapped off. The Mod by Ben Heck works well with the exception of a two games and possibly others that I do not own to test. This can also be affected by what TV is used. Ben mentions removal of the small RF Filter Chip in the lower right of the PCB for a better signal. Maybe this would have allowed the marginal performing game carts to work better? I did not do this for fear of frying the chip. I wanted a way to return the Atari 2600 Jr back to its original RF state. The Longhorn Engineer Mod seems to be the best method, it includes an additional chip to help with the video. However the additional expense for the parts kept me from going this route. In doing the various mods, I kept any removed parts salvageable. Since I want every one of my game carts to work on my TV, I have since reversed the Mod back to RF. I still want a Composite PlugnPlay to run all my Atari Carts, eventually I might tackle modding a Flashback 2 later on. Meanwhile I can play the 2600 games thru emulation and a SVideo connection on the big screen with the Dreamcast. CRTGAMER wrote: In closing I have to comment on my beloved Atari 2600 Jr. A very robust machine, it has been thru a lot and still kicking. I won't melt any more solder on her, been thru too much and still working. 1. Bought for 50¢ at the Swap Meet. Been dropped, abandoned overnight outside, rained on and covered with mud. Note the pic, there are still traces of dirt on the face buttons. 2. Burned thru three mods and multiple disassembles including desoldering components, resoldering the same components, heating up the legs around the Stella Chip and drilling holes in the PCB. Reassembled and held together by only one screw (the other pegs snapped off) the Atari is still alive. If only other products could take this kind of punishment! This Atari has been thru a real Venture. Don't worry baby, you can now rest and function normally again. You still have the prettiest logo around! Last edited by CRTGAMER on Tue Feb 07, 2012 10:08 pm, edited 31 times in total. Another aspect of portable gaming is a custom portable that runs home console games. The Portable FC Mobile II made by Hyperkin has a name that is misleading. It is not for Famicolm game carts, but actually takes NES game carts. This portable is loaded, any NES game cart will fit. The Direction and Action Buttons are a good size. There are two extra Action Buttons that offer Turbo Auto Fire, perfect for the NES Joust style game Balloon Fight or various SHMUPS. It takes four AA batteries or a six volt DC power adapter. The LCD is backlit and bright. A very nice feature is a Composite and Audio output to play games on a regular TV. There is also a mini headphone jack and volume controls at the bottom. 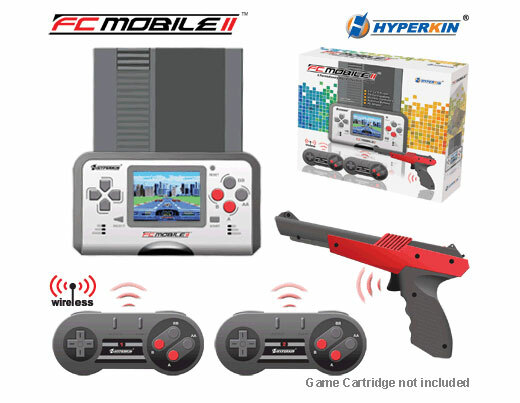 The FC Mobile can also be used with its own proprietary two wireless gamepads and lightgun. The wireless is not the best which uses Infra Red technology like a TV Remote, but it works. The lightgun of course will not work on the portable LCD screen, but any non HD CRT is fine with the aux video cables attached. Any game that needs the original controller connectors for accessories such as the Miracle Piano or ROB Robot are not compatible with the FC Mobile II. There are only a few games that are affected, most work fine using either the wireless controllers or built in controls. The system itself can be carried easily, but will not fit a pants pocket. NES carts are bulky which defeats the portable aspect unless just one game is brought along. The NES game PCB is actually small and can be moved to a custom cut down game cart shell. This is impractical though, every time another game needs to be swapped. Another option is to use a bootleg cart with multiple games. This offers the most convenient way to play NES games. No need to change game carts, simply press the Reset button of the FC Mobile II and the game Menu pops back up. Carry a whole shelf of games on a single game cart. Most multi game carts will be Famicoms so an import adaptor would be needed. The Gyromite Import Adaptor PCB is compact but with a Famicom PCB it still is about ⅔ the height of the NES cart shell. Not worth making a shell almost the same size as a regular NES cart. However, Famicolm PCBs with a Gyromite Import Adaptor fit very nicely inside a NES game cart shell. Ah well, part of the novelty for the portable is the huge grey NES game cart sticking out, definitely makes others look and smile or utter astonishment. The notorious NES Toaster console contact killer. Since there is no "bend" due to an awkward angle game cart on the end, the Game Genie can fit the FC Mobile II. However, it is a little tight and can still bend the pins open too much. Looking closely, the Game Genie contacts have a thicker plastic on the PCB compared to a NES game cart. It does not bend the portable springs at an angle as in a NES Toaster, but still can cause permanent damage. CRTGAMER wrote: The Game Genie Connector is almost twice as thick as a NES Game cart connector. Never use the Game Genie unless you want to permenantly damage your console or portable NES connector. The only way to fix a Game Genie is to build a thinner PCB cannibalized from a NES cart PCB. Dr Mario NES Cart Connector Thickness - .04"
I never leave a game cart plugged into a console or portable. The system cart connector's spring contacts may retain memory and not pop back out for another game cart. I really like the FC Mobile II. The only real improvement needed is a built in controller connector, at least one for real NES controllers. Even though not an official Nintendo deck, the video and sounds are crisp. The LCD backlit screen is more then enough in brightness. As a portable it works so much better then emulated systems. Original NES game carts can be bulky, a multi game cart is the way to go. The oversized NES cart sticking out definitely invites strange looks and a conversation starter. Usually the first comment is how did you build that, can you make one for me? Speaking of building portables, worth to mention Racketboy member Bacteria for any reader who does not know of his work. You can see some of his custom mods at his site or right here on Racketboy. Last edited by CRTGAMER on Thu Mar 07, 2013 7:57 pm, edited 6 times in total.